Channel your inner Steve McQueen with this 2019 Ford Mustang "Bullitt Coupe. 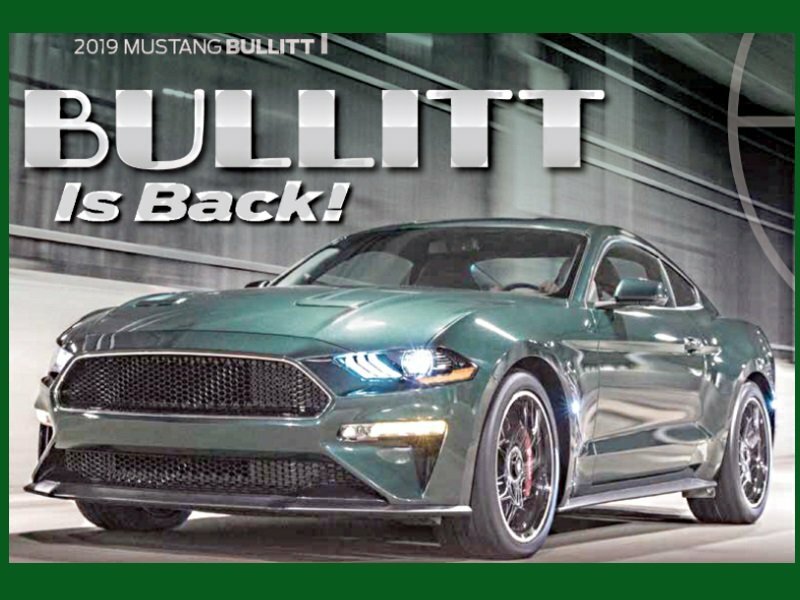 The Bullitt has a powerful Premium 5.0 Liter engine paired to this 6-Speed Manual transmission with dual mass flywheel, twin disc clutch, new gearing and rev matching. BULLITT ELECTRONICS PACKAGE -inc: Voice-Activated Touch-Screen Navigation System, pinch-to-zoom capability, SiriusXM Traffic and Travel Link w/a 5-year prepaid subscription, SiriusXM audio and data services each require a subscription sold separately, or as a package, by SiriusXM Radio Inc, If you decide to continue service after your trial, the subscription plan you choose will automatically renew thereafter and you will be charged according to your chosen payment method at then-current rates, Fees and taxes apply, To cancel you must call SiriusXM at 1-866-635-2349, See SiriusXM customer agreement for complete terms at www.siriusxm.com, All fees and programming subject to change, Sirius, XM and all related marks and logos are trademarks of Sirius XM Radio Inc, Blind Spot Info System w/Cross-Traffic Alert, Memory Driver Seat, Mirrors & Ambient Lighting, 3 settings, Radio: B&O Premium Sound System by Bang & Olufsen, CD player, 12-speakers and subwoofer in-trunk, HD Radio , EBONY W/GREEN STITCH, RECARO LEATHER-TRIMMED SPORT SEATS -inc: 4-way manual driver, 2-way manual passenger seats w/non-adjustable head restraints, DARK HIGHLAND GREEN METALLIC, Perimeter alarm, Wheels: 19" x 9" Fr & 19" x 9.5" Rr Aluminum -inc: 5-spoke bright-machined w/high-gloss black-painted pockets, Wheels w/Locks, Urethane Gear Shift Knob, Trunk Rear Cargo Access, Trip Computer, Tires: P255/40R19 Fr & P275/40R19 Rr Summer, Tire Specific Low Tire Pressure Warning, Systems Monitor, SYNC 3 Communications & Entertainment System -inc: enhanced voice recognition, 8" LCD capacitive touch screen in center stack w/swiping capability, AppLink, 911 Assist, Apple CarPlay and Android Auto compatibility and 2 smart charging USB ports, Strut Front Suspension w/Coil Springs, Streaming Audio.